At the April 23, 2018 West St. Paul city council meeting, council member Anthony Fernandez pulled the nomination of Samantha Green from the consent agenda and voted against her appointment to the Planning Commission. The move sparked accusations of sexism and a packed house at the next city council meeting. Fernandez has changed his story on this multiple times. Anthony Fernandez seems to say what he thinks you want to hear. And that changes from day to day. This is problematic for an elected official. It’s also problematic for someone seeking higher office. Anthony Fernandez filed to run for mayor of West St. Paul last week. So his word is even more important than ever. With that in mind, I’m going to explore some of the contradictory public statements made by Anthony Fernandez that came in response to this issue. 1. Why Did Fernandez Vote Against Green? On May 1, Fernandez called a special council meeting to re-vote for Green’s appointment. There wasn’t a quorum, so the meeting didn’t officially happen. But Fernandez said he voted against Green because he wanted the incumbent Planning Commission member, John Ramsay, to be reappointed. Fernandez spoke of the historical perspective Ramsay brought as well as his position with the South Robert Street Business Association (he reiterated this on Twitter, where he was specifically asked if it was personal). But while conversing with Fernandez on Twitter, it became clear that he had clashed with Green before. So I asked him if that influenced his decision to vote against Green. 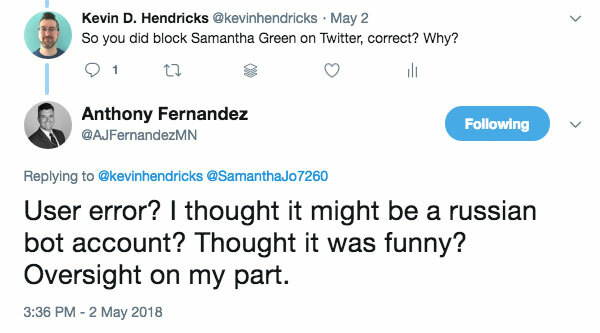 When Fernandez went to Twitter to condemn the harassment against Mayor Jenny Halverson and Green, someone pointed out that Green might hear his message if he hadn’t blocked her. But Green had receipts, and shared her screenshots. She had been blocked by Fernandez. Fernandez chalked it up to an oversight. But Green challenged him again, reminding Fernandez of a conversation they had about her being blocked. It wasn’t just an oversight. So why did he block her in the first place? Fernandez said he thought it was funny. At the May 1 special non-meeting, I asked Fernandez (and the other council members) about endorsing former Mayor David Meisinger. Meisinger had applied to the Charter Commission and, given his vulgar and sexist comments (see the 4/26 update at the bottom), I thought he had no business serving on a city commission. I wanted to hear from council members who had endorsed Meisinger in the past—would they still support him? At the May 1 meeting, Fernandez said he doesn’t endorse anybody. Later he specifically told me he didn’t endorse Meisinger during the 2016 campaign. A candidate Q&A made it clear that Fernandez had endorsed Meisinger, or at least Meisinger claimed he did. I asked Fernandez about this on Twitter, reiterating his statement that he didn’t endorse Meisinger and trying to figure out why Fernandez allowed Meisinger to say that he did. Fernandez accepted my premise about his statement, that he did not endorse Meisinger, and gave more deflection. Eventually he owned up to it (while throwing in more deflection)—he did endorse Meisinger. It’s an odd thing to not be straight about. I was simply asking if Fernandez would reconsider his previous endorsement given Meisinger’s recent behavior. And he would. Fernandez said Meisinger shouldn’t serve the city again. We were on the same page. So why all the shifting about whether or not he had endorsed Meisinger in the first place? At the May 1 special meeting, Fernandez was confronted about the issue of a lack of Ward 1 representation on the Planning Commission, which the appointment of Green would have provided. Fernandez admitted that ward representation is important, noted that he thinks Ward 1 has long been under-represented, along with the northern end of West St. Paul. Which is odd given that he had the opportunity to do so. At the April 23 meeting when the vote took place, Halverson raised this very issue. No one, including Fernandez, responded. It seems Fernandez didn’t give the mayor the respect of considering the point she raised. Anthony Fernandez tweeted on April 25 that he would be answering questions about the ongoing controversy at the May 14 meeting. A few days later he said he had family business in Florida and wouldn’t be able to attend the May 14 meeting. Mistakes happen, I’m willing to give him a mulligan. But those are adding up fast. Those are just the examples from my personal or other public interactions with Fernandez. Maybe there are others. We could write these off as minor incidents. Some of them are. But others, such as why he voted against Green and Ward 1 representation, cut to the core of the controversy. But taken together, these feel like a pattern. I asked questions trying to get the truth of what happened. I wasn’t playing a gotcha game with Fernandez. I was respectful. Yet he seemed to have trouble giving straight answers. I can understand an oversight or being mistaken. That’s fine. Sometimes even the truth is complicated. But if you are telling the truth, you shouldn’t have to keep changing your story. Fernandez has gone out of his way to say he’ll talk to constituents and answer questions (he’s said he’ll welcome “any questions anytime anywhere”). I applaud him for that. And I encourage you to ask those questions. Be respectful when you ask, but still ask and hold him to an answer. A cynical person would say he’s trying to appear transparent and approachable without actually being those things. I’ve had to call him on it when he’s tried to shut down my questions. I hope he’ll continue to answer questions, but he needs to figure out how to do it honestly and transparently. For someone who wants to be mayor, he’s giving a lot of conflicting answers. Now I will give Fernandez credit: He did apologize to Samantha Green and the people of West St. Paul at the May 29 meeting. He admitted he made a mistake. That’s more than the other council members who voted against Green have been willing to do. But it’s not clear if he understands what that mistake is. On Twitter, he seems to think the problem is the ensuing controversy: It makes West St. Paul look bad. Controversy is a mere consequences of the root issue. The real problem is sexism. Fernandez is eager to apologize and move forward—but he’s not willing to address the actual issue here. He still does not believe sexism took place at the April 23 meeting (an assertion also made in the Fox9 story). This is something Halverson came back to in her comments during the May 29 meeting. Many council members were quick to condemn the harassment that Halverson and Green faced. Duh. Of course they were. They’re not monsters. Nobody is upset about a lack of reaction to the harassment. The incidents were universally condemned. People are upset about what precipitated the harassment: The sexist behavior at the April 23 meeting. Women were ready to march on the city council the night of April 23, well before feminine hygiene products were left at Halverson’s and Green’s homes. This is something a majority of the council can’t seem to come to terms with, Fernandez included (and it’s not for a lack of trying—I made this clear to him when we talked on May 1). They’re welcome to disagree with the conclusion that it’s sexism, but when 20 women line up and tell you sexism is happening, maybe you should listen and stop changing your story. Anthony Fernandez has said multiple times that he wants to move past this. Halverson has noted that you don’t move past something like this, you have to learn from it. So the question is, has Anthony Fernandez learned anything? I’ve told him that people tend to trust politicians more when they’re transparent about their conflicts, admit their mistakes, and give straight answers. So far he’s admitting some mistakes (maybe not the right ones) and he’s eventually sort of transparent, but I’m not sure he’s giving straight answers. Well-written, awesomely-documented & right-on, this is! 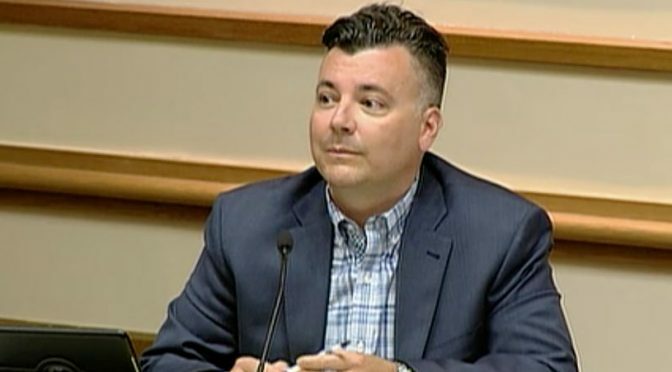 It did not go without notice that at the 5/29 council meeting, after his council comments, Anthony Fernandez even said “I hope I’m saying what you want to hear.” Nothing he says holds water. Even after multiple constituents told him that they do not appreciate, or want to be invited to private “meet for coffee” discussions, yet again, at that 5/29 meeting, from his public forum, Fernandez offered the public to meet for coffee (private discussions). Even Mayor Halverson reminded him of the previous complains about suggesting that. This means, even with being told something directly, Anthony Fernandez either forgets immediately, or clearly does not care. I tend to think the later. I absolutely do not want to see Fernandez as our city’s next mayor. Napier will get my supprt & vote. Not to be a stickler, but let’s go to the tape. Fernandez said, “I hope I’m hitting on things that you want to hear.” I agree that doesn’t sound great (especially in the context of my post), but I think he meant that he’s trying to address the various issues people wanted him to address. I think you could read maliciousness into that comment, but I don’t think that’s a fair reading of it. As for private coffee meetings, I think Fernandez is trying to be accommodating. Other council members (Iago) have said they’ll only talk with constituents in person face-to-face. Fernandez seems to be willing to talk with people anytime, anywhere. If you want that to be meeting for coffee, go for it. If you want that to be Facebook Live, go for it (he suggested that at the May 1 special non-meeting). I agree that it becomes problematic when a public official only wants to meet in private. There’s a lack of transparency and accountability there. However, sitting down with someone face-to-face can also be a less charged atmosphere where you can have a real conversation. Fernandez says he’s willing to talk on constituents’ terms, whatever those may be. I think that’s a good thing. However, as I tried to show in my entire post, I think what he actually says needs to be scrutinized. So well written and documented. Can we get shirts made saying “tony is full of baloney“?